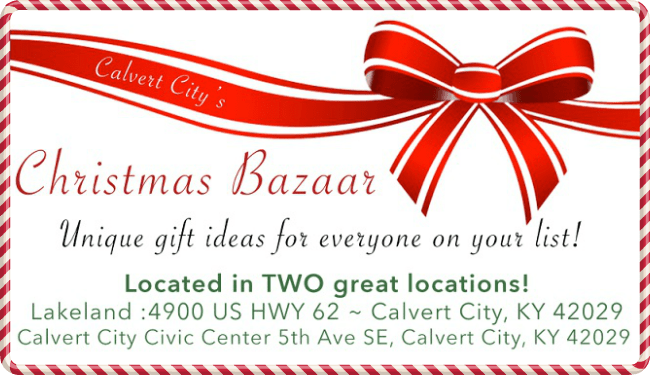 Calvert City’s Christmas Bazaar will take place Dec. 1 from 9:00 am to 4:00 pm in two locations – the Lakeland Event Center and the Calvert City Civic Center. The Bazaar will feature unique gifts, quilt raffle, $250 cash door prize, hourly door prizes and food vendors. For the kids, Santa with some goodies and a craft room. Proceeds will benefit the Calvert/Sharpe Family Resource Center as well as other family resource centers in the county. Help Santa stock his sleigh by becoming a sponsor. Click on the flyers below for more sponsor information and the booth registration form.